The Institute for Palestine Studies is pleased to announce that our latest book, In the Land of My Birth: A Palestinian Boyhood, by Reja-e Busailah, has been shortlisted for the 2018 Palestine Book Awards! This year 44 books were nominated for the award, with only six being shortlisted. The winners will be announced in November, 2018. 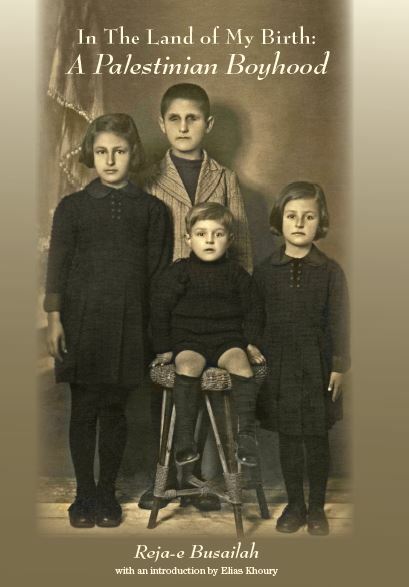 In the Land of My Birth: A Palestinian Boyhood recounts the coming of age of a blind Palestinian boy of modest milieu during the turbulent years leading up to the fall of Palestine in 1948. Above all, it is about the boy's life and his struggles to make his way in the sighted world, his upbringing, schooling, friendships, and adventures. It is a compelling human story with a treasure of information on popular culture and customs, the educational system, and Palestinian life. The Daily Star has called In the Land of My Birth “a remarkable story about overcoming the challenges of growing up blind in pre-Nakba Palestine.” Mondoweiss says the book is a “masterpiece of the Palestinian experience.” You can read an interview with Busailah and an excerpt of the book from Jadaliyya. Purchase In the Land of My Birth: A Palestinian Boyhood directly from our bookstore or Amazon. We are also pleased to congratulate longtime Jerusalem Quarterly editor Salim Tamari on receiving a 2018 Palestine Book Awards nomination for his book The Great War and the Remaking of Palestine (University of Californian Press, 2017).